John De St. Croix, 25, makes his first appearance in court at the Penobscot Judicial Center in Bangor on April 2, 2018. He appeared with defense attorney David Bate, of Bangor. A man allegedly responsible for the deaths of two people found last month in a blazing truck in Bangor was indicted Wednesday by the Penobscot County grand jury on murder and arson charges. 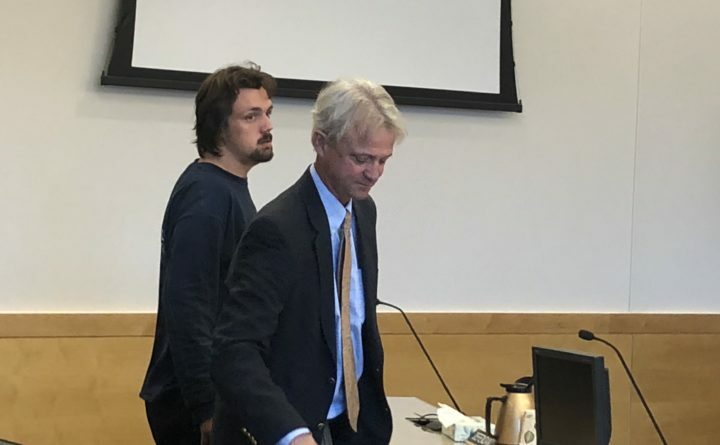 John De St. Croix, 25, of Bangor was indicted on one count each of intentional or knowing or depraved indifference murder, depraved indifference murder, arson and two counts of felony murder. De St. Croix is expected to be arraigned May 8 at the Penobscot Judicial Center. He is being held without bail at the Penobscot County Jail. The affidavit in the case remained impounded Wednesday, according to the court clerk’s office. It most likely will be unsealed after De St. Croix enters not guilty pleas next month. Bangor police detectives arrested De St. Croix on March 30 after interviewing him at the police station, two days after the bodies of Michael Bridges, 43, and Desiree York, 36, were found in a flaming box truck in the parking lot of Penobscot Plaza. The Maine medical examiner ruled their deaths homicides. De St. Croix initially was charged with two counts of murder. Investigators said last month that they expected additional charges would be presented to the grand jury by the Maine attorney general’s office. The additional charges appear to indicate that one of the victims was killed intentionally but the other’s death was unintentional, perhaps as the result of the fire. Felony murder appears to have been included as a charge as an alternative to the other murder counts. Felony murder in Maine is defined as causing the death of another person while committing a crime such as arson, robbery, burglary or other illegal acts. A request for comment from Assistant Attorney General Leane Zainea, who is prosecuting the case, was not immediately returned Wednesday. Defense attorney David Bate of Bangor said it is too early in the case to comment. A trial date is not expected to be set until after De St. Croix’s arraignment next month.